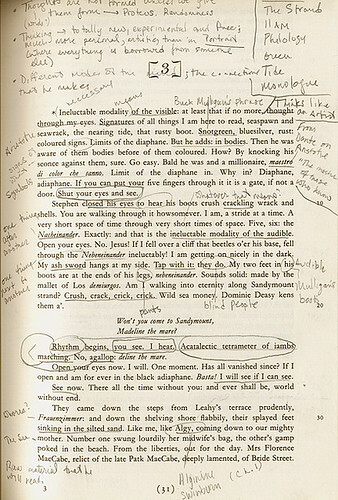 Close reading is a literary studies practice applicable to all kinds of cultural texts (e.g. films, novels, photographs, plays, etc.). Performing a close reading means making an interpretive argument about a text or texts, through detailed attention to and critical reflection on textual form and detail. Examples: For a sample close reading of a dramatic text, see this scene analysis of Oedipus for English 303. For a sample close reading of visual texts, see this student blog post about war propaganda posters. * What are possible patterns and/or connections among things you have marked? * Why these words, images, examples, stylistic choices, and not others? What does the text not say? * ask "How did this occur? ", "Why? ", and/or "How do I know this?" Structure: What is the organizing principle of the text's overall form? What determines the selection and arrangement of its subject matter or narrative? Development: how does the text develop? How do elements like setting, character, point of view, and plot establish the text's structure and advance its subject or story? Style: What distinctive diction, images, figures, patterns, and symbols are used? Tone: what is the text’s attitude to its subject, and/or to its audience? Theme: what is a major theme in the text? How do the categories above develop this theme? * interrogate the argument’s organization and premises: in framing an argument a certain way, and in basing it on certain assumptions, what other frameworks and assumptions does the article conceal or neglect? Kain, Patricia. "How to do a close reading." Lye, John. "Critical reading: a guide." Lynch, Jack. "Getting an A on an English Paper"